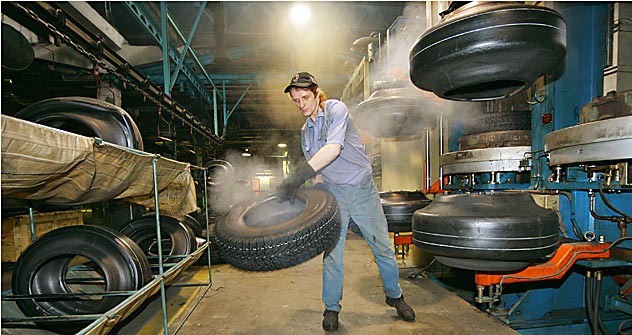 The Russian petrochemicals holding company SIBUR and India’s Reliance Industries Ltd are going to start manufacturing butyl rubber, a feedstock for tire manufacturing, in India. The project may break even in two to three years. The butyl rubber joint-venture agreement was signed during Russian President Dmitry Medvedev’s visit to India in December 2010. Reliance Industries will be the majority owner. SIBUR will contribute butyl rubber manufacturing and extraction technology. Reliance will provide the joint venture with feedstock and world-class infrastructure. The factory will produce generic butyl rubber at first, with special grades scheduled for production at a later stage. The initial capacity of Reliance’s petrochemical facility at Jamnagar will be equivalent to 100,000 tons of butyl rubber a year. At 2009 prices, 100,000 tonnes of butyl rubber sells for approximately $230 mn. “Given 2010 price growth of around 60%, sales may reach $370m,” said LenMontazhStroy Investment Company Head of Research, Dmitry Kumanovsky. Investment in the project will total $450 mn. Experts believe this is in line with industry standards ($4,000-4,500 per tonne of output), with a two- to three-year payback period. Given that according to some projections India’s economic growth in 2013 will surpass China’s current GDP expansion rate (9.5%), right from the start the joint venture would be able to capitalise on both volume and price increases. As a result, the project has the chance to break even earlier, Mr Kumanovsky believes. Cooperation in this area is mutually beneficial. Asia is one of the chief consumers of butyl rubber, responsible for a 15 to 20% share of global consumption. That’s why the launch of SIBUR’s facility will create an important competitive advantage for India. Furthermore, the factory’s products will be in demand in India’s expanding domestic market, particularly from its tire industry. The rise in the number of cars on the road could drive exponential growth in India’s car tire market over the next few years, along the lines of what happened in China. SIBUR is a major Russian petrochemical company and a leading global butyl rubber producer (Exxon Mobil Chemical is the world’s largest with a 50% market share, with the rest, including Lanxess, Japan Butyl Company, Yanhua Petrochemical Company, and SIBUR, splitting the remaining 50%). Its plants processed more than 16.8 billion cubic meters of oil associated gas in 2009 to make more than 15 mn tonnes of petrochemical products. SIBUR is expected to report more than $7 billion in sales for 2010. India will obtain a controlling stake in the joint venture in addition to advanced Russian technology that has been unavailable to Indian companies until now. SIBUR in turn will get to tap a promising new market and improve its financial performance through higher earnings to be generated in India’s market. India is not only a very promising market but also a rather closed one: SIBUR is the only company out of the five global butyl rubber majors to gain access. “For SIBUR, localisation of production in India is an important step towards cutting freight costs and improving supply logistics, because the product will be marketed there locally,” said Univer investment company Head of Research, Dmitry Aleksandrov. For Reliance, the joint venture with SIBUR is a membership card to the exclusive business club of the world’s key synthetic rubber manufacturers.